Hi! 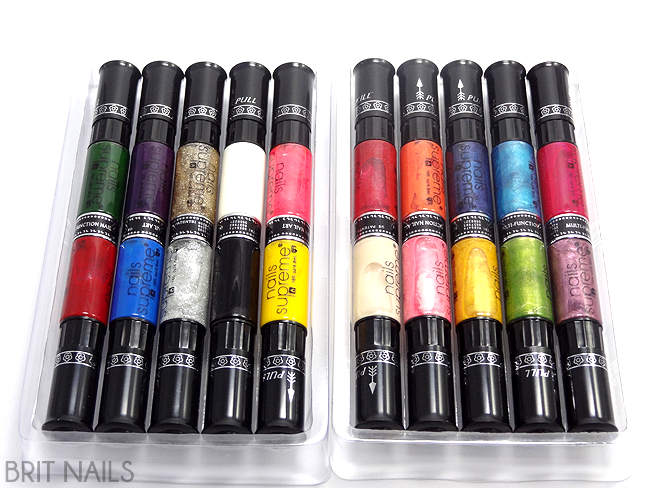 Today I'm showing you some nail art pens by Nails Supreme. I decided to re-create a lace design by Lucy's Stash as I think it tests out the pens pretty well! If you want to try the lace design for yourself you can find Lucy's tutorial here. There are two kits to choose from, plain or glitter, and each kit comes with 10 colours on double ended pens. Each pen unscrews at the middle, enabling you to mix and match them, which is pretty useful if you want to just take a couple with you somewhere. I love that little feature! Each kit also comes with an instruction booklet with ideas, and a little pin to clean out the tips of the pens. On the left is the plain kit, on the right is the glitter kit, which are actually shimmers rather than glitters. 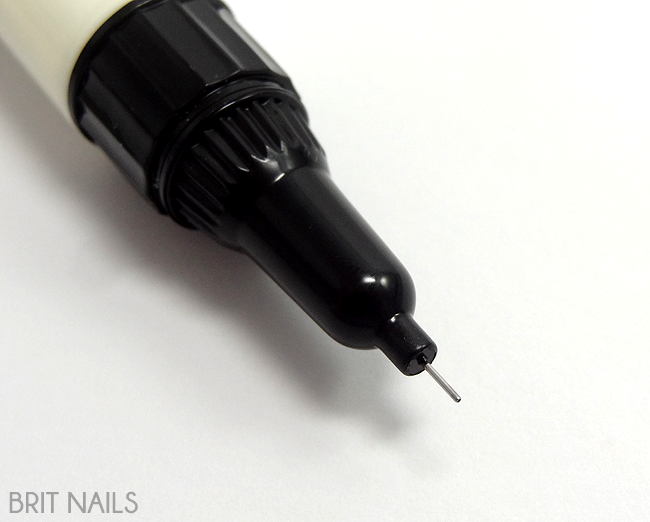 The tips are very fine which is what I look for in nail art pens! 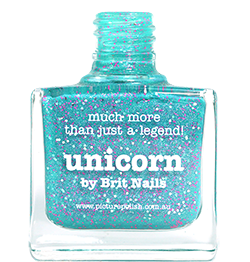 Each bottle also has a regular nail polish brush. I admit, I would have much preferred a striper brush and it's a bit odd that they have this instead! 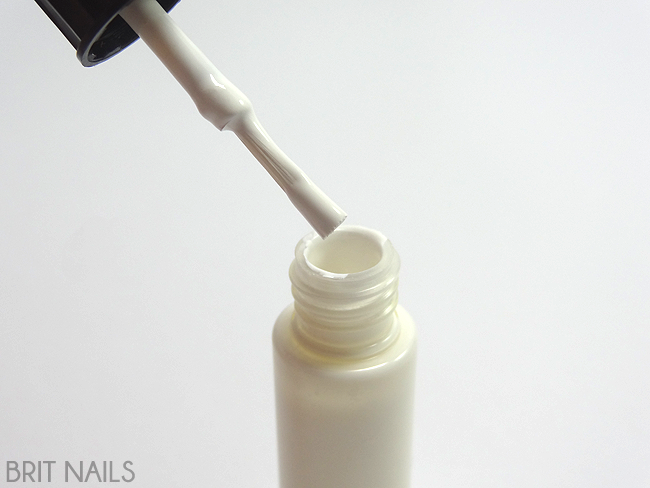 For my manicure, I started with a base of Models Own HyperGel in White Light. Once that was completely dry, I sponged on a gradient using HyperGel in Pink Veneer and Lilac Sheen. Once everything was dry (it's important to let the polish dry before you use a nail art pen or you'll drag it and ruin it!) I used the white Nails Supreme pen to draw on the lace design. It's not as good as Lucy's, I know, but it was my very first time! ;) the polish flowed easily out of the pen and I had no issues at all. Some of the polishes, like the white, are a bit more pigmented than others but overall I really love this kit! It's nice to own a full set of pens that work well. When I first started blogging, I bought one of those huge kits of 20-40 pens from China on eBay, and they were cheap but terrible and went straight in the bin! It's worth investing in a good kit if you're into nail art. My only issue really is that they have a regular brush instead of a striper brush. These kits are available from Supreme Pitch and Qwerkity (formerly Presents For Men...I know, weird!) priced £19.99 per kit. Ooh gobs these are so pretty. Think you need some serious patience to get them looking this good though! Oooh, I've been lusting after these nail art pens for a while, but until I can justify such an expenditure I'll have to stick with my Primark P.S. ones (which are great for the price but not as exciting at the Nails Supreme pens). Beautiful lace design over a perfect gradient. I think I need to get me one of those nail polish pens. This looks amazing! I'm going to attempt to give this a go myself! I love ombre effect you've done underneath, I tried something similar the other day and it looked nowhere near as lovely! Very pretty :) Great photos :) Pastels aren't my favourites but I like them on you, also the pattern is precise.